Zimbabwe teachers suspend strike, return to work – Royal Times of Nigeria. 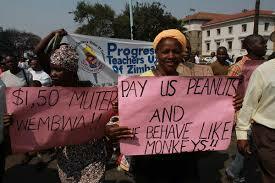 Teachers’ unions met Education Minister Paul Mavima in Harare and agreed to return to work on Monday. The two biggest unions, the Zimbabwe Teachers Association and the Progressive Teachers’ Union, said after the meeting that the government should take advantage of the detente to instrospect and come up with well thought out, meaningful, and long-lasting solutions on the salaries grievances. It said failure by the government to meet their demands would see teachers going back on strike. Teachers, like other public-sector workers, are demanding U.S. dollar salaries and an increase in allowances to cushion them against soaring inflation and economic hardship.